My East Bay 49 (JOY ANN) is now back at her home dock on Indian Creek in Killmarnock, VA. Thanks to you and your staff she looks and runs perfectly. My experience in leaving my boat in your yard for the winter could not have been more satisfying …Your yard is well organized and knows how to get the job done. This law applies to all PWCs, and any boat with a motor of 10 horsepower or greater. It does not apply to canoes or sailboats, unless they have a motor of 10 horsepower or more. Keep in mind that the minimum age to operate a PWC in Virginia waters is 14, but there is no minimum age for motorboats. 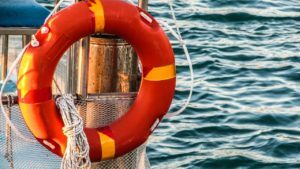 An approved boating safety course will provide instruction on operating and maintaining boats, as well as state and local boating laws and requirements. This course should also cover how to handle an emergency. Once you’ve completed the course and earned your boater education card, it does not expire and does not need to be re-issued unless it gets lost or damaged. In Virginia, NASBLA approved boating safety education courses are offered both in a classroom and online. Experienced boaters also have the option to take a proctored challenge exam to earn their card. There are many places where you can find and take a boating safety course or challenge exam. The Virginia Department Of Game and Inland Fishing offers boating safety courses all across the state. Most of these courses are free of charge, and are open to individuals 12 years or older. The course materials are set at a 6th grade reading level. To find a VDGIF boating safety education course near you, click here. There are also several websites that offer online boating safety education courses that are NASBLA approved. Virginia law states that you must spend at least three hours on this course, whether taken online or in a classroom, so be prepared for that. www.boatus.org offers the boating safety education course online for free, and also has advanced classes that you can pay for. www.aceboater.com offers the course online for $19.95, and allows unlimited tries to pass the unit quizzes and the final exam. www.boatcourse.com offers the course online for $24.95, and you are able to re-take any unit test you fail to pass. www.boat-ed.com offers the course for $29.50, and also allows unlimited attempts to pass the course. www.boaterexam.com offers the course online for $29.95, and allows unlimited retries sould you fail to pass. The last option is to take a proctored exam. This is for experienced boaters who have a good working knowledge of Virginia boating laws. The exams are offered in various locations throughout the state, and there are no reference materials allowed. It is highly recommended that you study the Virginia Watercraft Owner’s Guide beforehand. You can find a scheduled challenge exam near you here. Keep in mind that these laws are meant to keep everyone safe out on the water. If you haven’t attained your boater education card yet, please schedule a course or exam today to get the ball rolling. And as always, happy and safe boating from Atlantic Yacht Basin!